Evening clouds will give way to clearing overnight. Slight chance of a rain shower. Low 42F. Winds NNW at 5 to 10 mph..
Evening clouds will give way to clearing overnight. Slight chance of a rain shower. Low 42F. Winds NNW at 5 to 10 mph. Various test printings sit atop the Epilog Laser Fusion Printer. 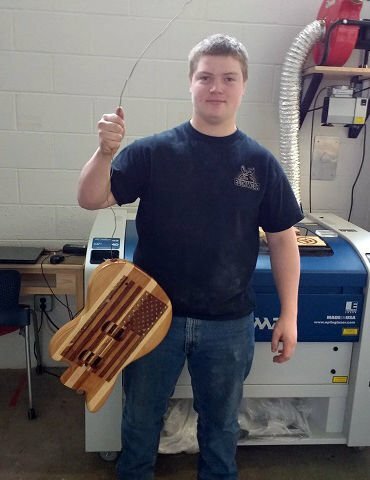 Justin Smith holds his guitar, which was etched with the image of the American flag with the new laser engraver. Shown is the Epilog Laser Fusion printer. Abigail Alford snapped this photo of her sword plaque. BROCKWAY — For decades, science fiction movies and books have presented lasers that can carve, write, draw, and trim. Some science fiction becomes science fact, and now an Epilog Laser Fusion M2 sits in Brockway Area Junior-Senior High School Teacher John Barrow’s classroom. It does not just sit. Since arriving in Barrow’s room, the laser has improved guitars, cut out Christmas ornaments, printed signs, etched drinking mugs, etched a plexiglass paperweight, and carved out the Mayan calendar. Barrow got the idea as a chance to enhance his guitar-building class while attending a STEM guitar-building conference at Butler County Community College. Barrow talked to the salesperson and discovered that the particular model he was seeing was part of a line that could run from $4,000 to $100,000 dollars. This was not something the school could just pick up at Walmart. Barrow was not sure Scarnati’s people could come up with the grant money, so he suggested what he thought was a longshot number. Before he knew it, he had the go-ahead to find a laser engraver. The engraver has a laser in the bottom, brought up to the cutting surface through mirrors. Students manipulate images in Corel Draw, which requires Barrow to teach more than just managing the laser. A complex project was a newly-built guitar. Junior Justin Smith wanted an American flag on the front of his guitar, so he researched several designs before settling on one. Smith and Barrow had to trace the design, measure it, figure out the depth it needed to be, and then calculate the settings on the machine to get it to burn correctly. 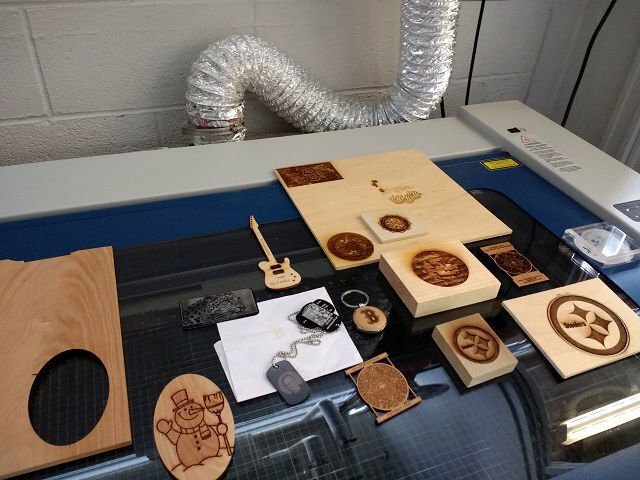 The laser engraver can do more than just dig into wood. For instance, Abigail Alford wanted to put a Celtic design on a sword plaque she made for Brockway Director of Bands Justin Salada. Alford had to design the artwork so parts of it bled over the actual plaque. This gave the design a flowing look. Barrow showed the pieces of wood that had the remaining designs with the cut in the middle of the plaque. Barrow showed pieces of glass and metal etched with the engraver. He also had several wood pieces that had text or art. Barrow can do paper, plastic, wood, clay, leather, metal, cardboard, rubber, glass, and ID numbers on tools. Currently, he and the students are experimenting with 3D wood images, dog tags, and signs. Smith appreciated that opportunity with his guitar, which he holds from a wire because he just sprayed polyurethane over it. The students’ enthusiasm for the product is exactly what Barrow wanted to hear. Plentiful sunshine. Warmer. High 69F. Winds light and variable.